A-HOTEL.com - Luxury and cheap accommodation in Polkovnikovo, Russia. Prices and hotel, apartment booking in Polkovnikovo and surrounding. Set in Novoaltaysk, Rus Hotel provides free WiFi. All rooms feature a kitchen and a shared bathroom. Located in a quiet area, 20 metres from the Ob River in Barnaul, Zarechie Hotel features an on-site restaurant serving European cuisine and free Wi-Fi throughout the hotel. Rooms at Hotel Zarechie offer a flat-screen TV with satellite channels, air conditioning, and a private bathroom. Situated in Barnaul, Вилла венеция features free WiFi, and guests can enjoy a garden, a terrace and a bar. Each unit is fitted with a balcony, a flat-screen TV, a well-fitted kitchen and a private bathroom with free toiletries. Located in Zarinsk, Uyt Inn offers accommodation with private terraces. Free WiFi is provided. Situated in Barnaul, Apartment on Prirechnaya 2A features air-conditioned accommodation with a balcony and free WiFi. The property has river views and is 8 km from Avalman Ski Lift 1. Hotel Sfera features free WiFi and views of city in Barnaul. The property is around 9 km from Avalman Ski Lift 1, 9 km from Avalman Ski Lift 2 and 9 km from Avalman Ski Lift 3. Апартаменты на Анатолия 26 in Barnaul features accommodation with free WiFi, 8 km from Avalman Ski Lift 1 and 8 km from Avalman Ski Lift 2. The property is 8 km from Avalman Ski Lift 3. Студия Интернациональная 18 offers accommodation in Barnaul, 9 km from Avalman Ski Lift 1 and 9 km from Avalman Ski Lift 2. The accommodation is 9 km from the Avalman Ski Lift 3 and has free WiFi. Situated in Barnaul, 9 km from Avalman Ski Lift 1, апартаменты на Интернациональной 18 offers a living room with a flat-screen TV, and free WiFi. Guests staying at this apartment have access to a fully equipped kitchenette. Set in Barnaul, 8 km from Avalman Ski Lift 1 and 8 km from Avalman Ski Lift 2, Studiio-apartment v Centre Barnaula provides accommodation with amenities such as free WiFi and a flat-screen TV. The property is 8 km from Avalman Ski Lift 3. Hotel Laletin is situated in one of the oldest buildings in the historic centre of Barnaul. It offers spacious rooms with free Wi-Fi and has a Finnish sauna. Апартаменты в центре offers accommodation in Barnaul, 8 km from Avalman Ski Lift 1 and 8 km from Avalman Ski Lift 2. This apartment provides accommodation with a balcony. Situated in Barnaul, 8 km from Avalman Ski Lift 1, 8 km from Avalman Ski Lift 2 and 8 km from Avalman Ski Lift 3, Никитина 74 features accommodation with a balcony and free WiFi. The property features city views. Located 7 minutes’ walk from the Central Market and Park in Barnaul city, this hotel offers a roof-top bar with glazed ceiling and a spa centre. It also features a sauna, and free Wi-Fi is available throughout. 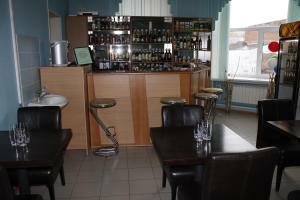 This hotel in central Barnaul features free Wi-Fi in all areas. The banks of the Ob River and a river boat station are only a 7-minute walk away. "Comfort Russia" на Партизанской is situated in Barnaul, 8 km from Avalman Ski Lift 1 and 9 km from Avalman Ski Lift 2, in an area where fishing can be enjoyed. The property has river views, plus is 9 km from Avalman Ski Lift 3. Set 8 km from Avalman Ski Lift 1 and 9 km from Avalman Ski Lift 2, "Comfort Russia" на Партизанской provides accommodation located in Barnaul. This apartment features accommodation with a terrace. Located in the centre of Barnaul, this apartment features a balcony. The unit equipped with a kitchenette with an oven and microwave. Situated in Barnaul in the Altaysky Kray region, Студия has a balcony and city views. Guests staying at this apartment have access to free WiFi and a fully equipped kitchen. Apartments at prospekt Lenina 27А is set in Barnaul. Guests staying at this apartment have access to a fully equipped kitchen.